Nothing sends love like a stunning display of eighteen white roses. The lovely 50 cm roses are combined in a clear glass vase with seeded eucalyptus to create a bouquet that is simply breathtaking. The bouquet makes an excellent choice for anniversaries, sympathy, and any other occasion where a grand impression is to be made. 18 White Roses (50 cm). Arrives in a stylish glass bowl vase with fresh water, ready to be displayed. Measures approximately 13" x 13". Eighteen White Roses is a hand delivered gift. These gifts are delivered by one of our local design centers located throughout the United States and Canada. Same day delivery is available for most gifts when ordered before the cutoff time. 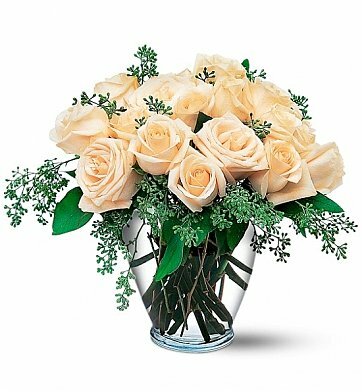 The cutoff time for Eighteen White Roses is 2 PM in the recipient's time zone. The florist was outstanding. The arrangement was so nice my wife prefers white roses now. The arrangement was perfect as was the customer service. I made a mistake on the delivery date (Memorial Day) and they called and made the delivery the following day, with no problems or attitude although it was my mistake. I will definitely use them in the future instead of another major flower company. The service is better, the arrangement is fresh delivered not boxed, and the price is better. Bye bye other flower companies!